The Suspension bridge built on the Gokak Falls which is the property of the Gokak Mills has been closed for tourists and only the Staff of the Gokak Mills Ltd. Can use it during prescribed timings. This was a dampner for many as they could cross the 130 year old structure which is a hot spot at the falls. 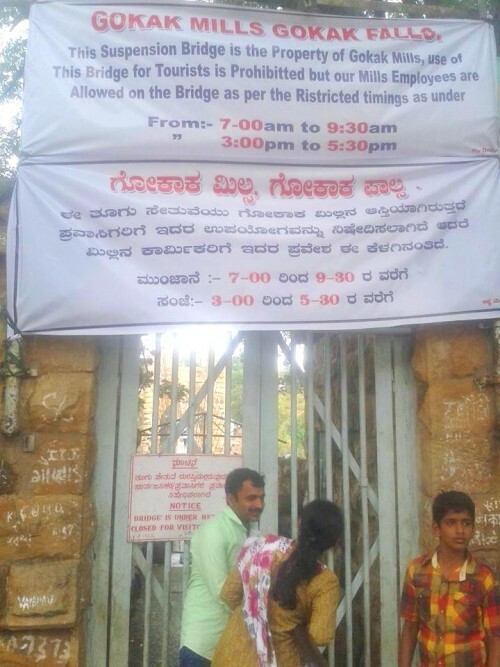 The Gokak mills has closed it for tourists as the guarantee of the bridge was over recently and they dont want to risk the lives. But this raises huge questions on what the tourism department is doing?